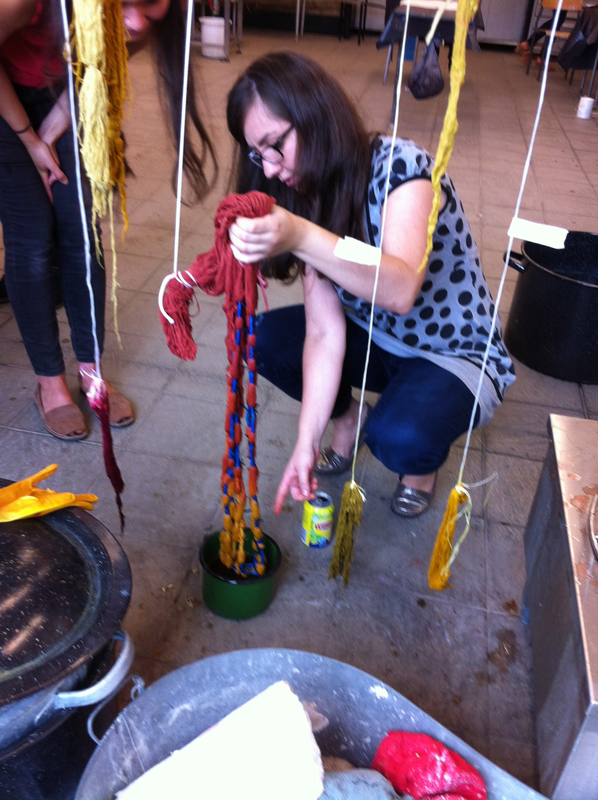 A group of international students convened at the Strzemiński Academy of Fine Arts in Łódź, Poland to participate in “Resist!,” a two week intensive course on designing and dyeing cotton warps with red and yellow plant based dyes. Participants from Poland joined with other textile artists from England, Iceland, Ireland, and Spain. 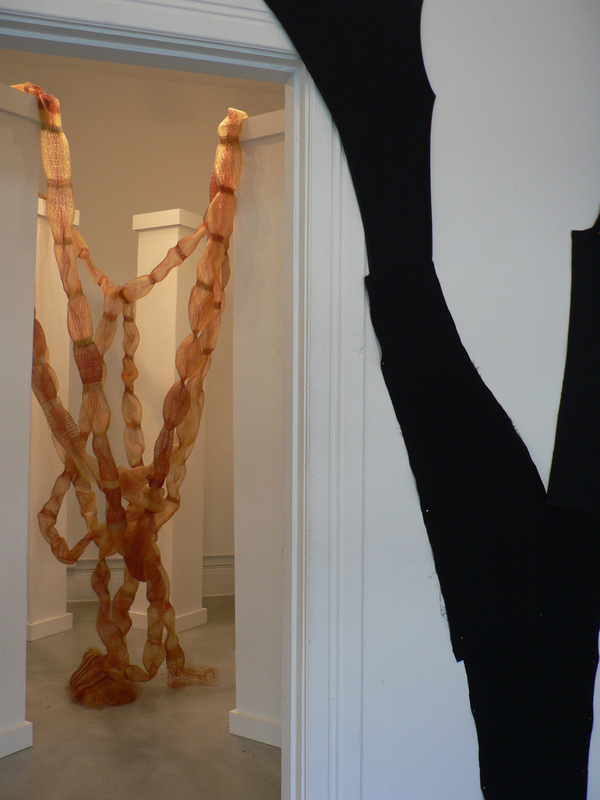 The academy is home to an extensive and well respected textile art, design and fashion program. 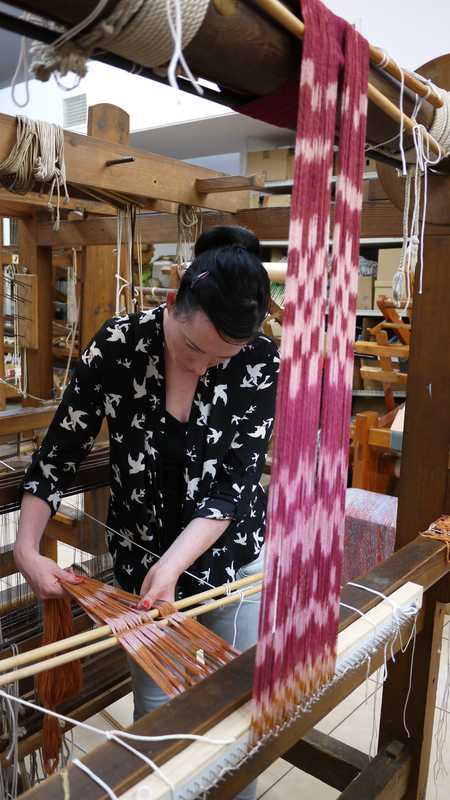 Students wove on looms from historic mills that populated the city since the 19th century. This entry was posted in Brazilwood, madder root, natural dye, Uncategorized, weaving on August 14, 2014 by wendyrweiss. 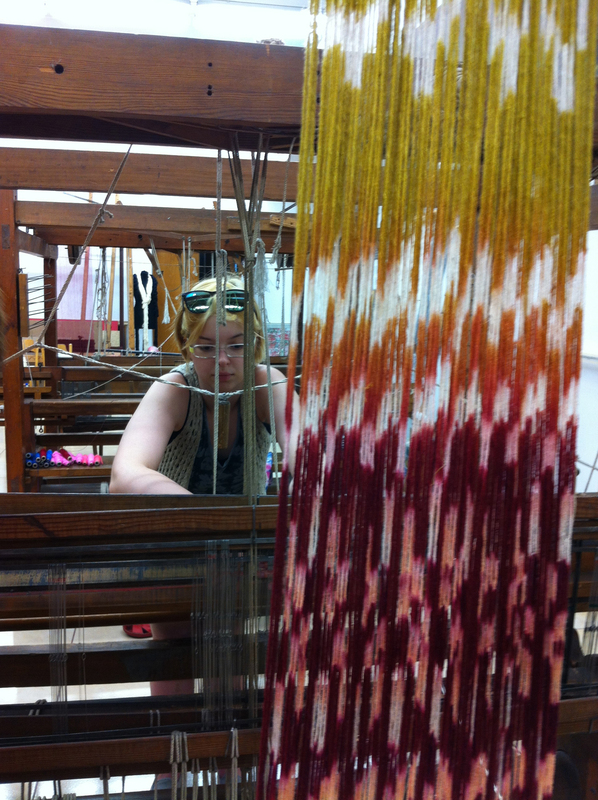 I have been waiting to weave up the warp that I dyed in the summer of 2013. Finally, I have the time to put it on the loom and weave it up. Dyes are from madder and cosmos flowers. 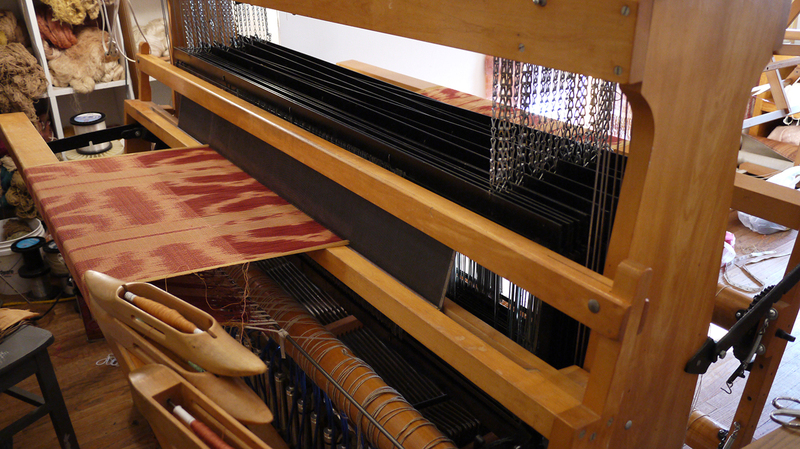 The weave structure requires 16 shafts and I am using 3 colors in the weft. 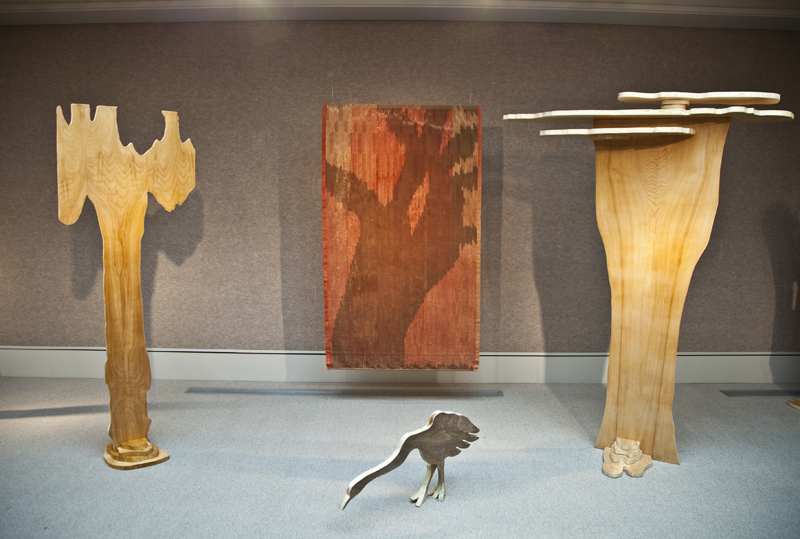 Exhibition by Jay Kreimer and Wendy Weiss at the Tugboat Gallery in Lincoln, NE. 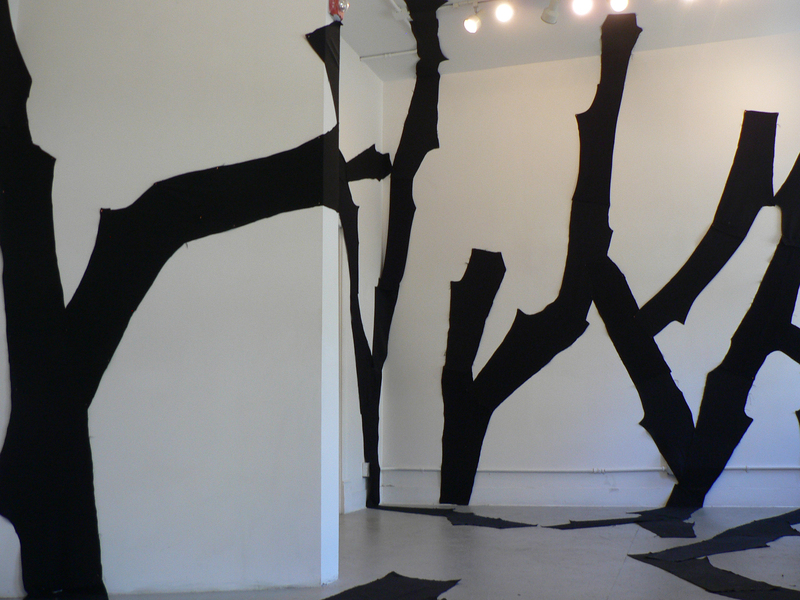 Sept. 7-29, 2012.
. Weiss draws on the textures and linear elements of the places where she walks. The environment is immersive, expansive and playful yet contained. Core is a 100 foot woven tube suspended by six columns. The work fills the room. 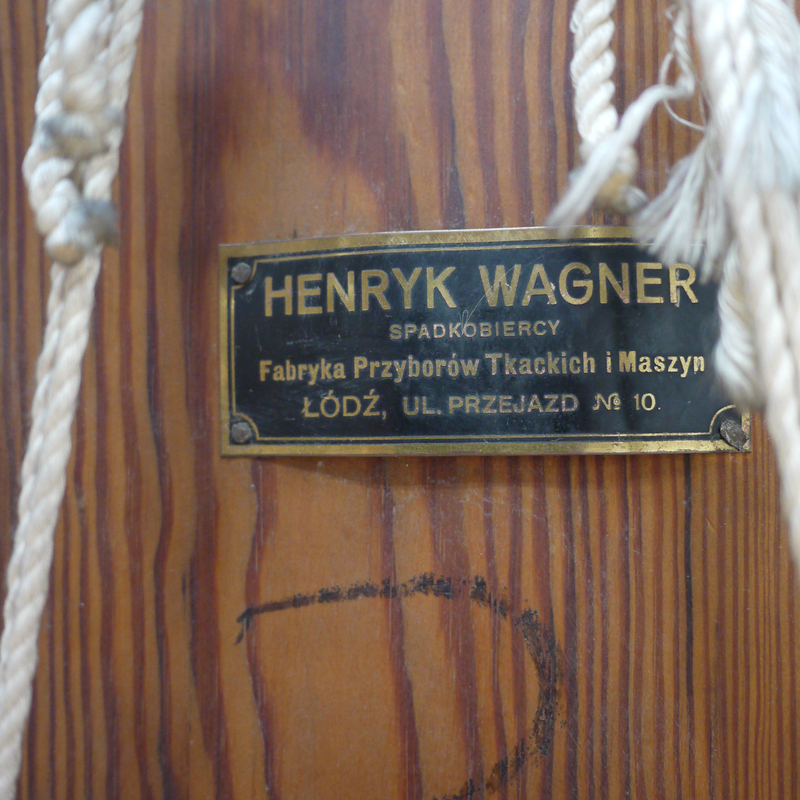 The columns anchor and form a body for the very interior presence of the Core weaving. 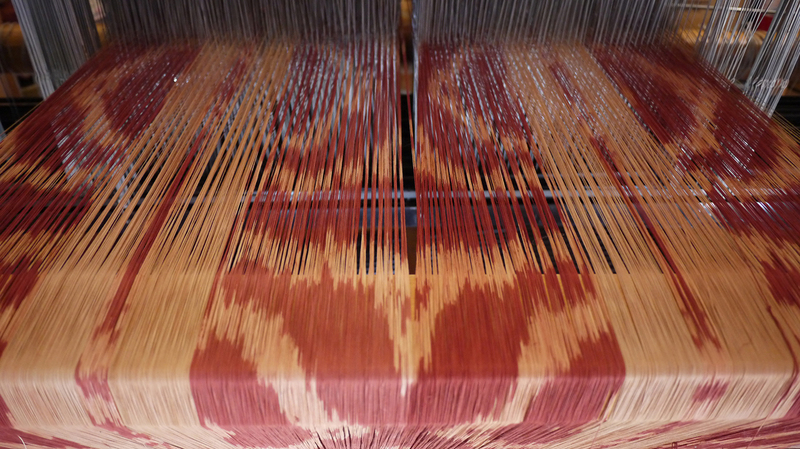 The weaving suggests the workings of the body: intestinal, umbilical, essential. It is exaggerated and deeply human. The feeling of gravity and concentration plays in contrast to the encompassing space of the tree scape. 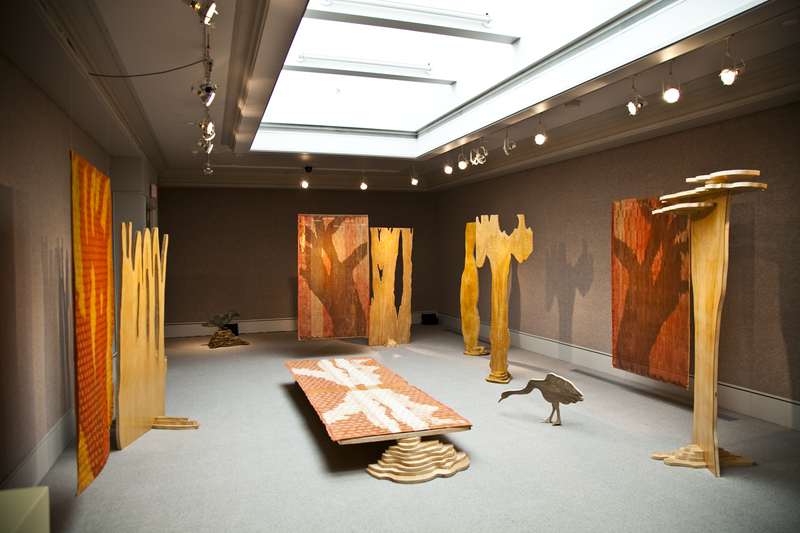 The viewer walks through the Treescape and gazes into the Core. The Hard-To-See Theater plays with contraction and expansion, exterior space and interior space. The radically dropped and angled ceiling covers a red wooden stairway to a platform. Three heads rest on columns in an almost classical style, one nearly normal except for a feral smile, another red with devil’s horns, and a third wearing a crown. Stooping to climb the stairs, the viewer discovers a viewing area that opens onto a small theater with thirty-two seats and three people in the audience. The film seems to be concerned with uncertainty and biology—The Everyday Interests of Young People. The three members of the audience, who turn periodically toward the viewer, seem to be enjoying the show. The materials in Kreimer’s Hard-To-See Theater are recycled and precycled. The steps and platform use lumber salvaged from a neighbor’s deck. The video and heads suggest a remembered walk through psychic space. The false ceiling is precycled (we thought we coined it!) and will be reused to insulate and finish an attic ceiling. Weiss and Kreimer’s The Everyday Interests of Young People plays with human spaces, interior and exterior, and the passage between the open and the enclosed. The contrasts and continuities in the three rooms charge each other and invoke qualities of the many spaces humans inhabit. This entry was posted in madder root, multi-shaft weaving, natural dye, Uncategorized, weaving on September 25, 2012 by wendyrweiss. 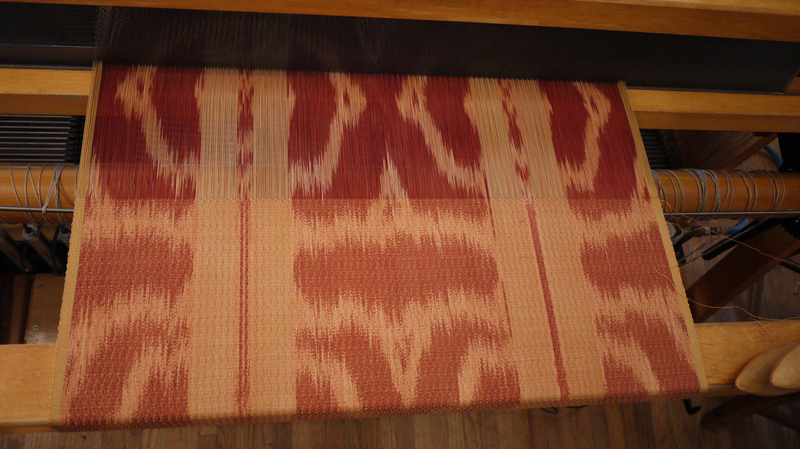 This entry was posted in cosmos, madder root, multi-shaft weaving, natural dye, weaving on May 31, 2012 by wendyrweiss. This entry was posted in cosmos, madder root, multi-shaft weaving, natural dye, weaving and tagged madder root, natural dye on May 29, 2012 by wendyrweiss.